Last week, we let you know about a dangerous and deceitful mailer that the anti-union Buckeye Institute is sending to homes urging public employees to quit their unions. The mailer LIES, flat out, about the dangers of union affiliation. The massive statewide mailing appears to be targeting Ohio teachers and other public employees. And worst of all, the Buckeye Institute has your personal information, like home address, email and phone number, to push their harassment tactics. Where and how the anti-union group obtained your personal data is of grave concern to OCSEA! Sponsored by millionaires and billionaires who hate unions and the benefits their members receive, the Buckeye Institute has been behind Ohio public employee attack campaigns for decades. This includes, just to name a few, blaming public employees for the most recent recession; pushing to destroy and privatize public pension plans; and fighting to undo Ohio collective bargaining through Senate Bill 5 and other Right to Work schemes. But OCSEA members aren’t falling for the lies. They know that unions built this country and, when unions thrive, so do working families! Across the state members are trashing these fliers, and better yet, some are returning the mailers with a very stern message: “I’m sticking with my union, no matter what!” Check out what one union proud OCSEA member did with her mailer, tearing it into pieces to create a very special message of solidarity. 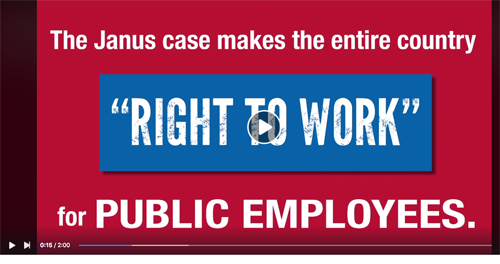 Watch (and SHARE) this video to take a stand against these immoral and invasive attacks against Ohio's public employees!